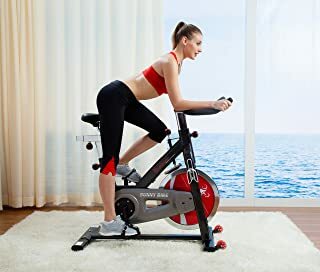 The Sunny Health & Fitness SF-B1002 Belt Drive Indoor Cycling Bike comes from a manufacturer who taps into resources from around the world to bring you an assorted indoor cycle range. The Sunny Health & Fitness SF-B1110 is another bike in this range that offers similar features at varied prices. The SF-B1002 Indoor Cycling Bike is Sunny’s high rated upright cycle. This reasonably priced home cycle offers many features backed by solid quality. The Sunny SF-B1002 Indoor Cycling Bike comes with an upgraded Belt Drive while the other models have a chain drive. This ensures a smooth, quiet workout in the comfort of your home. The Sunny SF-B1002 is an upright cycle that has a heavy front flywheel. The heavier the flywheel, the smoother the ride without a clang or wobble. It also offers more angular momentum against your muscles. This gives the rider an experience of riding a real cycle. As these bikes offer a real cycling experience, they are the preferred bikes at the gyms. This cycle offers an excellent cardiovascular workout at a minimal impact on your joints. The SF-B1002 Indoor Cycle has a 49-lb. the flywheel that offers a quiet, vibration-free session. It also features an adjustable resistance that simulates an actual road ride. 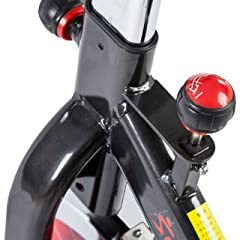 The bike offers variable resistance at the turn of a knob that presses the felt pad to the flywheel. The cycle comes to a stop by a press down brake system. The saddle comes with a padded seat while the handlebar is adjustable. All these parts are mounted on a strong steel frame that is portable due to the transportation wheels. Maximum user weight 275 lbs. The Steel Frame is heavy duty to withstand high speeds and levels of resistance. The low center of gravity offers higher stability and anchorage to the bike. The Chrome-edged Flywheel is 49 lb in weight and 18 inches in diameter. The overall design and graphics are pleasing to the eye and efficient to use. The Belt Drive System turns the flywheel making a smooth workout at a steady resistance. The Resistance System is a top down felt pad that is applied manually at variable levels. The Emergency Brake offers a top-down resistance to stop the cycle instantly. The Sports Pedals wit straps for a good grip and leverage while pedaling. The Pedal Thread size is 9/16 while the Q Factor is 7 ½. The Handlebar are padded for a comfortable non-slip grip due to sweat. The Handlebar Adjustment happens upwards and downwards. And the extension allows you to lean forward while paddling. A Saddle Seat is padded for comfort and movement. The Seat Adjustment helps fix the seat in all the four directions. The inseam height of the seat is 40 inches while the minimum height is 29 inches. The Transportation Wheels allow for the easy storage and use. The Water Bottle Holder is to the right side of the frame. The rack comes with some tension to prevent your bottle from slipping or spilling. The bike comes with a 1-year warranty on the frame and 90-day warranty on the mechanical parts. The bike is well packed before shipping. The shipping weight is 126 pounds and it may be free of cost if bought through certain retailers. The bike comes almost completely assembled with the flywheel and the various knobs attached. The manufacturer has separated the base stabilizer bars to reduce the size and awkwardness of the box while shipping. Follow the instructions in the assembly manual and you will be working out in 30 minutes. To download Sunny Health & Fitness SF-B1002 Assembly & Owner’s Manual click here. The Sunny Health & Fitness SF-B1002 Indoor Cycling Bike with a belt drive ensures a quiet workout. The 49-lb. the flywheel is wobble- and clang-free. It offers smooth even resistance to your muscles. 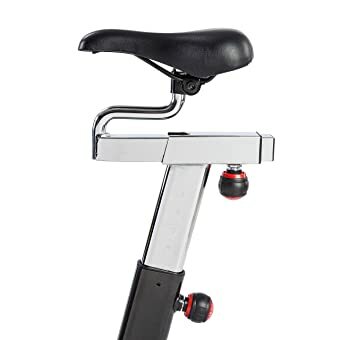 The bike offers manual Variable Resistance at the turn of a knob. This offers you infinite possibilities of the workout. Adjustable Seat & Handlebar move up or down to accommodate users of varying sizes. The bike supports a weight of 275 pounds. The saddle seat is padded for comfort ensuring long workouts. The pedals have toe straps for grip and comfort while paddling. The transport wheels make it easy to stow away and bring out as per your workout schedule. The handlebar cannot be adjusted upwards and downwards. This bike does not come with an LCD display. One can remedy the lack of the LCD display via the smartphone and the various workout monitoring apps available for free. 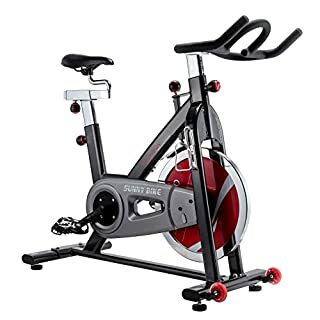 Overall the Sunny Health & Fitness SF-B1002 is a great belt drive indoor bike within $500. You can exercise in the standing and seated position due to the strong and stable frame. The heavy flywheel and the belt drive ensure a smooth, steady resistance. It is also a vibration free quiet exercise equipment that makes good economic sense too. Product images sourced from Amazon.com. Eugene has been a fitness enthusiast for most of his life and has always believed in the benefits of a healthy lifestyle. He loves encouraging people to live healthy lives and to empower them to feel strong.